The meta description of your page has a length of 155 characters. Most search engines will truncate meta descriptions to 160 characters. 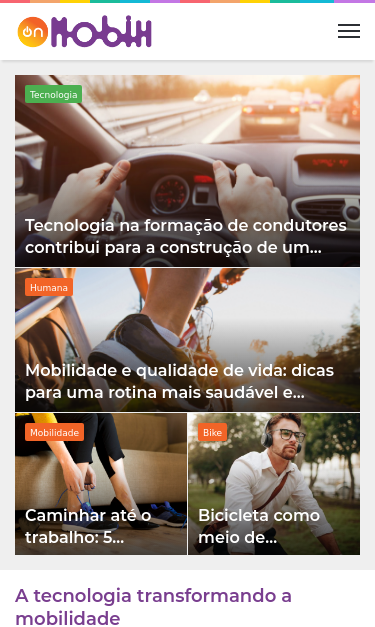 Somos um canal difusor de ideias e de conteúdo transformador sobre as tendências do universo da mobilidade, social, urbana, corporativa, ou seja: HUMANA. Congratulations! The size of your webpage's HTML is 23.83 Kb and is under the average webpage's HTML size of 33 Kb. Faster loading websites result in a better user experience, higher conversion rates, and generally better search engine rankings. Congratulations! Your webpage is successfully compressed using gzip compression on your code. Your HTML is compressed from 168.29 Kb to 23.83 Kb (86% size savings). This helps ensure a faster loading webpage and improved user experience. Your website loading time is around 8.59 seconds and is over the average loading speed which is 5 seconds. https://www.onmobih.com.br and https://onmobih.com.br resolve to the same URL. Your webpage is using the canonical link tag. This tag specifies that the URL: https://www.onmobih.com.br is preferred to be used in search results. Please ensure that this specification is correct, as canonical tags are often hard-coded and may not always reflect the latest changes in a site's URL structure. Patinetes elétricos: quanto custa e como alugar um em SP! Trânsito na Europa: o que podemos aprender para aplicar no Brasil? Websérie: Mobilidade E Segurança #1: Afinal, O Que É O SUSP? Afinal, o que é mobilidade humana? Mobilidade humana e segura é a nossa vibe. Qual é a sua?